Basements. Garages. Attics. 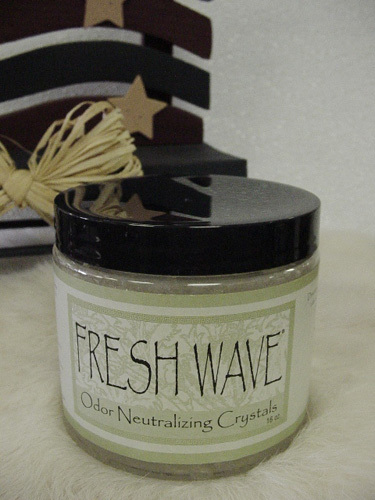 All places prone to nose-crinkling odors, and all perfect locations for Fresh Wave Continuous Release Crystal Gel. Just open the jar and eliminate odors – it’s really that simple. The 16 oz. jar is perfect near a cat litter box or tucked in the corner of a gym locker. It’s odor neutralizing power lasts for 30 to 90 days Non-toxic and non-irritating, Fresh Wave neutralizes odors without relying on harmful chemicals. Instead, our products are made up of natural ingredients, so they’re safe to use around people and pets. With harsh chemicals, masking fragrances and unknown fillers, you should be turning your nose up at the contents of traditional air fresheners. Ditch the aerosol can and experience the unmatched odor-eliminating power of Fresh Wave. No matter where you find troublesome odors – your kitchen, bathroom, basement, garage or even boat or RV – you can find a Fresh Wave solution.